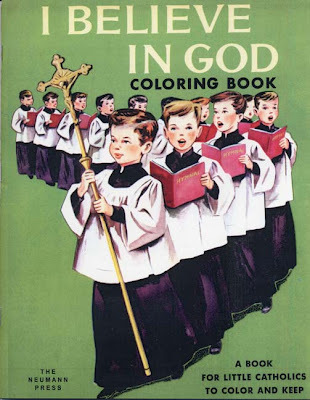 Comics, drawings, photographs and pleasantly musty thoughts from British cartoonist John Bagnall. 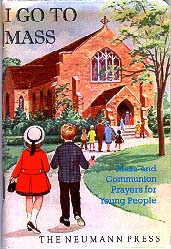 The Neumann Press in the USA have been reprinting Catholic childrens books from the 50s, some in quite elaborate editions. 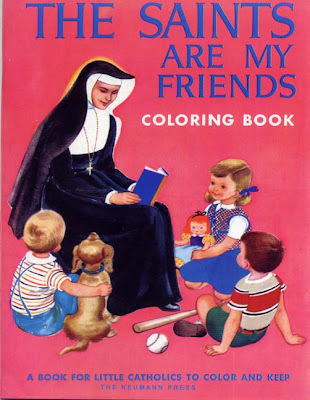 Above are examples of colouring books for "little catholics" which appeal to me because I'm a big fan of this super-saccharine style of retro illustration. However the Neumann Press have loftier aims than nostalgia, these reprints are intended for home-schooling use. 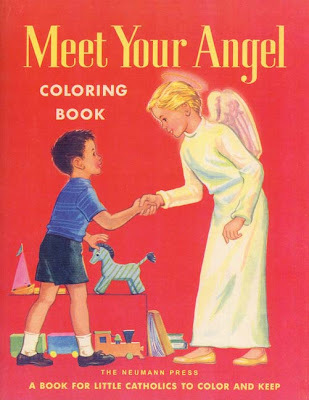 I'm all for Christianity being counter-cultural but surely these home schooled kids are in for a shock when they eventually discover 21st Century America is not filled with bobby socks, cute pups and friendly guardian angels?